Don't you think that the word "adapting" (as in "adapted from XYZ cookbook") is just a nice term for "stealing someone else's recipe but having the decency to acknowledge him"? Or does it just sound funny to me because English is not my first language? This Spinach Tart recipe is adapted from the vast archives of 101 cookbooks. Or is it just based on or inspired by the original recipe, since I renamed it and made slight changes? 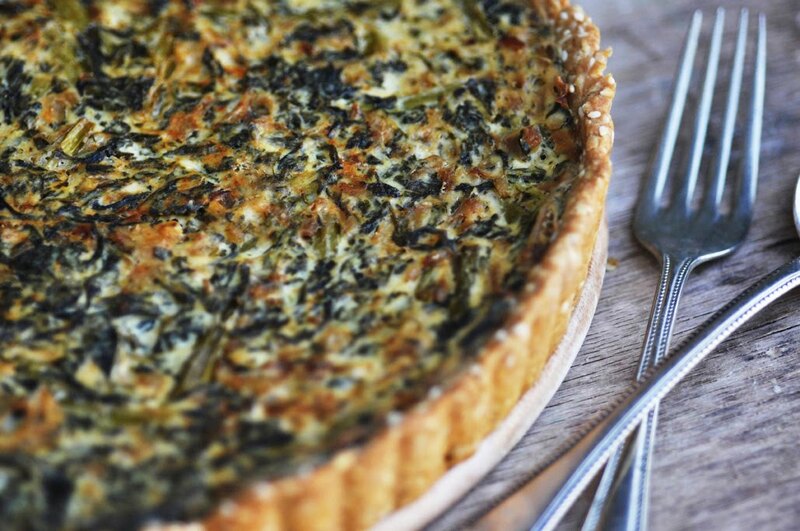 Heidi Swanson calls this tart Spinach Mushroom Quiche. It is not so much a quiche, since it does not contain any eggs, dairies or butter. In fact, it is vegan. The filling is made with tofu, with which I have a love-hate relationship. I don't really know why I am trying so hard to like tofu. But the occasional recipe gets me into trying it again. And a tofu-based quiche recipe definitely got me curious. What Heidi totally understated in her post was the uber-sensational sesame oat crust made with olive oil or sesame oil. It is the best crust I have ever eaten in my whole life. The slightly thicker edges stayed crumbly even after 45 minutes in the oven (my other pie crusts always got somewhat hard there). And the sesame seeds gave it a wonderful twist. This will be my one and only tart crust recipe from now on. Now about the filling: I swapped asparagus for the mushrooms, to make it a little more seasonal. The texture of the filling was very quiche-like. The tofu taste was quite predominant, and I wasn't sure if I liked it when I had the first bite. But it grew on me very quickly, and I actually enjoyed this tart very much. Another note, for those who read Heidi's post: it did not take 3 hours to make this tart. From start until I put the thing in the oven, it took me exactly one hour, plus another 45 minutes for the tart to bake. Not to bad actually, for something extraordinary like this. The tart can be prepared in advance and kept int he fridge for a few hours before baking. Roll out the dough on a lightly floured surface. Put the dough in the tart pan. Press it down evenly, making sure to fill in the fluted sides of the pan. Trim the tart of any excess dough. Cover with foil or damp towel and keep refrigerated while you make the filling. In a wide saute pan over medium heat, warm 2 tablespoons of the oil. Add the onion and asparagus, raise the heat to high, and saute for 10 to 12 minutes, stirring and shaking the pan until the vegetables are caramelized. Add the wine and scrape up any brown bits from the bottom of the pan with a wooden spoon. Season with 1/2 teaspoon of the salt and continue to cook until dry. Using a rubber spatula, scrape the vegetables into a mixing bowl and set aside. In a small saucepan over medium heat, warm the remaining 5 tablespoons of oil. Add the garlic, basil, thyme, and red pepper flakes. Simmer gently for 3 to 4 minutes or until the garlic is golden. Do not let the garlic brown or it will become bitter. When done, transfer the garlic oil mixture into a food processor. Crumble the tofu into the bowl of the food processor. Add the lemon juice, vinegar, and remaining 1 teaspoon of salt and puree until smooth. Add the tofu puree into the mushroom-asparagus mixture. Remove and discard the tough stems of the spinach. Wash the leaves. Cook the spinach leaves in a covered pot of boiling water until just wilted, 2-3 minutes. Drain in a colander and rinse under cold water to arrest the cooking. Drain well and squeeze dry. Transfer the spinach to a cutting board and chop fine. Add the spinach to the rest of the filling and stir well to combine. Fill the tart shell with the tofu and vegetable mixture and smooth the top with the back of a spoon. Dust with Paprika. Bake for 45 to 50 minutes, until firm. Let the tart cool for 8 to 10 minutes before slicing and serving.